In 2012 Plan TL and Engineers Without Borders Australia collaborated extensively to identify a range of areas for growth within the district of Lautém that will have broader implications for not only the children, but the community as a whole. 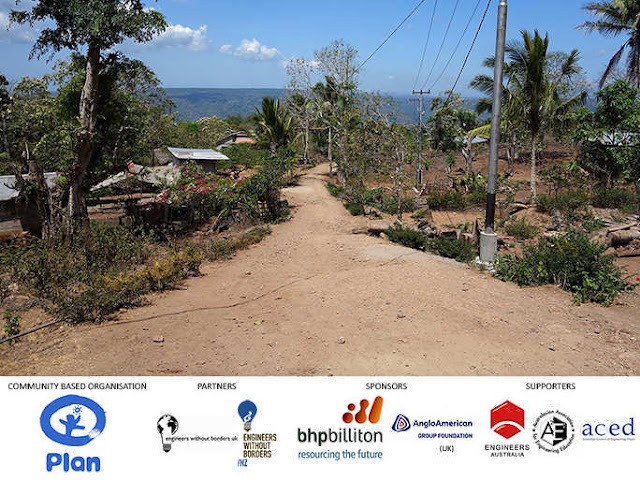 Students are invited to develop innovative and appropriate project solutions for those areas and as such make a real contribution towards the sustainable development of the town of Codo in Timor Leste. Student projects for this year have been separated into seven overarching design areas including; infrastructure and construction, water supply and sanitation systems, energy, waste management, transportation, information communications technology and climate change. Codo, and the Lautém sub-district are located in the North East of Timor Leste. Lautém has an economy primarily based around supporting itself. The livelihoods and well being of children, young people and women are dependent upon agriculture, which is strongly influenced by unique climatic conditions. Lautém is the only sub-district to have a surplus of food stocks, yet shows food shortage for the highest amount of months indicating that mobility of food, transport infrastructure and markets all require further growth. Towns within the region are thus highly vulnerable to the wayward extremes of weather conditions that occur and food sustainability is of particular importance alongside youth development, with just under half the population below the age of 18. Plan Timor Leste has been working with local NGO’s in the communities of Timor Leste since 2001, helping poor children and youth to access their rights to education, health, livelihoods and protection. Plan's vision is of a world in which all children realise their full potential in societies that respect people's rights and dignity and it does this through implementing programs aimed to improve early childhood education, water, sanitation and hygiene services, child protection, youth livelihoods and youth participation. With the help of all challenge participants, Plan and EWB intend to extend that collaboration to the community of Codo as a whole and from there even further afield. Participate in the Timor Leste EWB Challenge to assist the development of Codo in Lautém. You can download the Outline and design brief below. Program rules and submission requirements can be found within the outline. Design should be innovative, low cost, small-scale, affordable and appropriate. Design should take into account cultural customs, local norms and religion. Proposed solution must be sustainable through considering the way that local materials, skills and knowledge of the local community are used. Designs should be durable and take into account the natural environment, including disasters and climate change and sustainable land management. Specific information and data resources are available from the navigation bar at the top left of every EWB Challenge page. To get started take a look at these photos of Codo to get a feeling for the area. The EWB Challenge is one of many programs supported by Engineers Without Borders Australia. To become an EWB member or to contact your local chapter please click here. The Engineers Without Borders Australia Challenge (EWB Challenge) is an Australasian design program for first-year university students. Students work in teams to develop conceptual designs for sustainable development that contribute towards real international development projects. Follow this link for more background information.